Just about every Riverfest Qualifier right around the country normally sells out. So it was something of a surprise to see the one on the Old Nene at March did not. Perhaps those who stayed away knew the form of the water was not quite up to scratch. Unfortunately we have not had a lot of cold or wet weather yet, hence the lower weights than we have come to expect at the venue. Once we get a good flush through it’s going to hit top form for sure. Local rod Dave Cooper took the honours from hot peg 1, the same peg that won last week’s March Open match. Cooper decided to fish bread-punch, taking the gamble that the bigger skimmers and odd tench would not show. It was something of a negative approach but it paid off handsomely as he kept the fish coming all day for a match-winning 12lb 1oz. Danny Mason came second with 11lb 14oz, followed by Rob Hurn with 11lb. Three section winners now go through to the grand final on the River Wye in a couple of weeks time. They are Dave Cooper (A section), Danny Mason (B section) and Andy Moss (C section). Round three of the East Midlands Winter League on the Old Nene at Benwick fished better than expected with all those in the frame breaking into double figures. Top rod from the fancied B section at the Benwick village end of the match length was Godmanchester tackle dealer Stan Binge. The pressure is always on when you draw well but Binge is no stranger to the big match atmosphere, having fished for his country not so long ago. He started the match fishing bread-punch for roach and got off to a good start with roach after roach being taken. By the half way stage he was well up with the leaders in his section. Then he decided to switch to his worm and caster line looking for bigger fish that would give him the edge. And it paid off as he bagged three good tench to give him the nod over the chasing pack with 14lb 8oz. Runner-up was Pete Vasey (Maver Image) with 13lb 9oz of roach and a bonus tench. 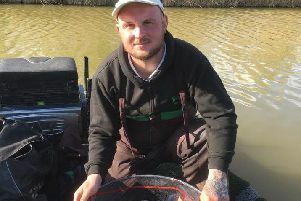 March rod Alex Bates was third on 13lb 6oz, followed by Colin Oakman (12lb 5oz) and Andy Spence (11lb 13oz). On the team front Browning Hotrods did remarkably well to come out on top with 24 points as several of their anglers were missing, fishing the big Riverfest event which took place on the same day. Current league champions Maver Image are running into top form and came second on the day with 25 points and then it was Stanjay Gold with 29. At the halfway stage it looks to be a three-horse race between league leaders Browning Hotrods on four points followed by Maver Image on seven and Stanjay Gold with eight.